Dee Williams and "The Big Tiny"
WORDS—Tiny houses are totally trending. Whether it's because small things are inherently adorable, because we've romanticized the notion of "living simply," or because folks are legitimately concerned about the size of their environmental footprint, Dee Williams gets it. The author of "The Big Tiny" has been living little since 2004 and reads from a memoir about her experiences. 6 pm. Paulina Springs Books, 252 W. Hood St., Sisters. $5 (refundable if you buy the book). BASKETBALL—After last year's rally season, fans have high hopes again for the Blazers, and before they take to the court for their first official game of the season, they are barnstorming the state and traveling to meet their fans one by one. Seriously. Damien was asking about you. 4-6 pm. 360 SW Bond. Free. 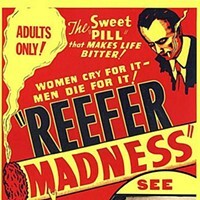 HIGH ART—With weed just a few weeks away from likely legality, the fine actors at 2nd Street Theater take a cheeky look at marijuana use with a stage adaption of Reefer Madness. Inspired by what was meant to be a mid-30's scare-them-straight film, the propaganda has back fired again and again over the decades, and now lands as a musical in Bend. 7:30 pm. 2nd Street Theater, 220 NE Lafayette Ave. $19-22. JAZZ—The fifth anniversary of Jazz at the Oxford kicks off with King Louie's Portland Blues Review III. 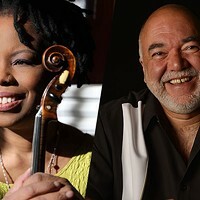 The group features LaRhonda Steele and Andy Stokes on vocals, Lisa Mann on bass and vocals, Renato Caranto on tenor sax, Peter Dammann on guitar, Edwin Coleman III on drums, and trombonist Danny Armstrong. Yes, it's a long list of seasoned musicians, well worth a listen. 5 pm and 8:15 pm. Oxford Hotel, 10 NW Minnesota Ave. $42. SCARY STORIES—There are ghosts that float among us, from the haunted top floor of the old elementary school to the sneaky pick-pocket who preys on tourists at the Old Francis bungalows. Take a (daylight) walk with Bend's own ghostbusters—or, at least, storytellers. 4 pm. Des Chutes Historical Museum, 129 NW Idaho. $10. THEATER—This play written by Martin McDonagh isn't an upper. It's quite horrifying, really. Moving, awkwardly funny, uncomfortably laughable, and always dark, the committed acting truly reveals a humanistic quality to the deeply disturbing storyline. 7:30 pm. Thurs.-Sat., Oct. 23-25. Volcanic Theatre Pub, 70 SW Century Dr. $15. PARTY—Kick it old school this Halloween with Mario, Luigi, and their mushroom-loving animated friends. With guest DJs, costume contests, a themed photo booth, circus performers, a laser light show and Nintendo-themed art exhibits, it will basically be like walking into your favorite childhood video game. Only, with booze. 9pm-3am. Midtown Ballroom, 51 NW Greenwood Ave. $10 at the door. 18 and over, alcohol with ID. CIRCUS—Described as an African Cirque du Soleil, Cirque Zuma Zuma takes the high caliber contortionism and acrobatics and raises it South African gumboot dances (think: the roots of modern stepping done by African-American fraternities and sororities), Gabonese tumbling, and Tanzanian stage pole acts. Not the sort of thing you see in Bend everyday. 3 pm. Tower Theatre. $27-42. SCARY STORIES—Over the past 100 years, the glaciers in the Sisters Wilderness Area have been gradually fading away. Geomorphologist Jim O'Connor (that is, a guy who studies the "science of scenery") talks about the history of exploring, climbing, and glacier photography in the Pacific Northwest by showing historical and present-day glacier photography. 5:30 pm doors, 7 pm event. McMenamins Old St. Francis School, Father Luke's Room, 700 NW Bond St. Free. FILM—The Source's free movies return! In celebration of Halloween, we invite you to drink Worthy Beer and get your hair trimmed by the ladies of Bishop's Bend. Ok—we know—it's a Christmas movie. But it's pretty scary, too. And to kick off our Holiday Movie Bonanza we thought we would pack in as many holidays as possible. 7 pm. Old Stone Church, 157 NW Franklin Ave. Free.